This is a Japanese MINO yaki serving plate set. Mino-yaki started about 1300 years ago. During late 16th century to early 17th century, tea ceremony became popular and special Mino-yaki tea sets were produced for the tea masters who have special preferences. Mino-yaki is known as playful ware. It features bold shapes, unrestrained decorating and unique glaze. These characteristics are more likely seen in modern art in the west but asymmetric beauty was already appreciated 400 years ago in Japan. There are various kinds of Mino ware. They are well-used in Japan. As a matter of fact, over 50% of Japanese table wares are Mino-yaki. 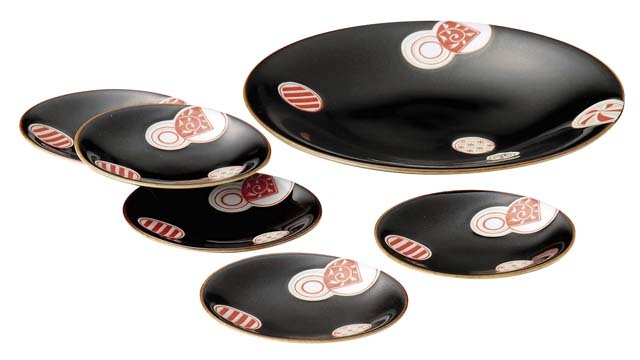 Mino-yaki are beautiful and fun ware, which are perfect for entertaining your guests with Japanese food! Neo-Futuristic Site for Tamago Kake Gohan (T.K.G)! !